Developmental progress continues on NASA’s James Webb Space Telescope (JWST) with the successful completion of static testing on its primary mirror backplane support structure (PMBSS). This backplane will serve as the backbone of the observatory and is critical to the image gathering abilities of this highly-anticipated successor to the Hubble Space Telescope. “Static testing demonstrates the backplane has the structural integrity to withstand the forces and vibrations of launch and is the final test prior to starting the integration of the backplane with the rest of the telescope,” said Lee Feinberg, NASA’s Optical Telescope Element manager at the agency’s Goddard Space Flight Center in Greenbelt, Maryland. The PMBSS was verified through this static testing by mounting it to a structure that evaluated its load support capabilities, and verified it can withstand the forces from its launch atop an Ariane 5 rocket, which is currently scheduled for 2018. This serves as the final test needed before the start of the PMBSS integration with other components of the telescope. Webb’s PMBSS will support the telescope’s primary scientific instruments and the primary mirror, comprised of 18 beryllium mirror segments that work in conjunction to form a 21-foot-diameter optical surface. Flawless precision is required for this primary mirror to perform in space, and gather the starlight that astronomers working with JWST will analyze in the future. JWST will be subjected to extreme temperatures in space ranging from -406 to -343 degrees Fahrenheit. To ensure that the primary mirror segments are kept relatively in the same position, the materials that comprise the PMBSS must not move of flex more than 1/1,000 the diameter of a human hair which is around 38 nanometers. The PMBSS structure is built from advanced fabrication and state-of-the-art material, including lightweight graphite and other composite parts that total more than 10,000 assembled pieces. All combined this assembly weighs 2,180 pounds and is strong enough to support 7,300 pounds of mission payload and scientific instruments. 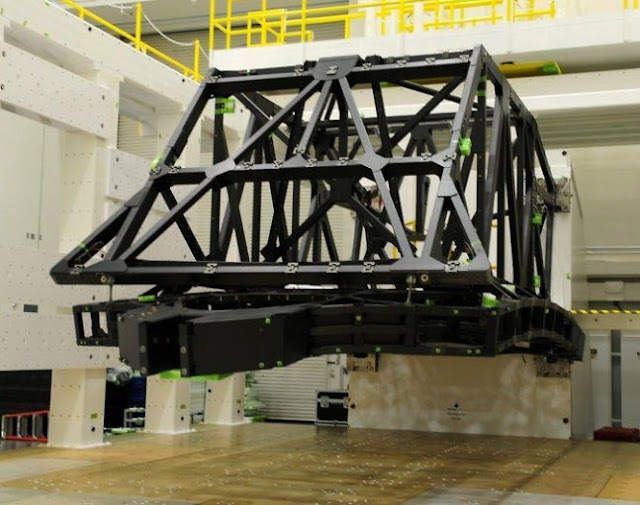 Next in line for JWST will be the creation of the overall Optical Telescope Element (OTE) when this support structure is integrated with its deployment elements and installation with its array of mirrors at NASA’s Goddard Space Flight Center in Greenbelt, Maryland. Cryogenic testing of the PMBSS with continue at Goddard once the integration of the primary mirror is completed, which will follow up on the extreme cryogenic thermal evaluations that occurred at NASA’s Marshall Space Flight Center last fall. Despite setbacks, near cancellation, budgetary concerns and more than a decade of delays, JWST continues to strive for realization. If everything continues as planned, this next-generation observatory will give insight to distant planets, shed light on scientific mysteries and answer questions about the creation of the universe. This joint project between NASA, the European Space Agency (ESA), and Canadian Space Agency (CSA), is designed to provide thousands of astronomers around the world infrared images to aid in future scientific discoveries.